Between spring 1976 and summer 1977, the “Son of Sam” shooter David Berkowitz killed or wounded 13 New Yorkers, young couples who were sitting in their cars, in parks, or on the street. Until his arrest on August 10, 1977, no one knew who the shooter was. For more than a year, terrified New Yorkers suspected their neighbors and even members of their own families. 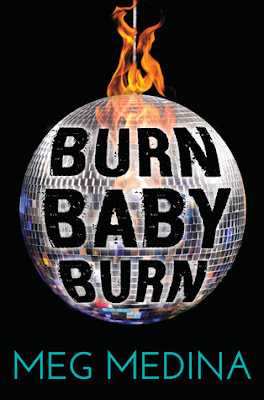 Meg Medina perfectly captures this climate of fear and suspicion in her new YA novel Burn Baby Burn, beginning with 17-year-old protagonist Nora López’s panicked walk home at night with her best friend, Kathleen, and their encounter with a stranger who turns out to be an undercover police officer and a friend of Kathleen’s father, a fireman. The policeman brings them home with a warning, but that’s only the beginning of Nora’s troubles. Her younger brother Hector, spoiled and excused by their single mother, has gone from truancy and disrespecting teachers to arson and domestic violence. Still, Nora and her mother refuse to tell anyone. They’re afraid of what the neighbors will think, and they search for every shred of evidence that Hector will pull his life together. At work—a full-time job Nora juggles with school because she plans to move into her own apartment—she is attracted to the new guy, Pedro, but they have no place to go, lest they become victims of the mysterious killer whom Nora fears may be her own brother. Compounding Nora’s isolation is the baggage her mother brings as an immigrant from Cuba. Nora’s mother was one of the first wave to leave after the revolution, and she idealizes what her life was like there in comparison with what she now faces with two teenage children, a vanishing job in a factory that makes audiotapes, and an ex-husband who is constantly behind in paying child support. Although Nora finds a potential mentor of sorts in her downstairs neighbor, Black activist Stiller, Nora’s mother labels Stiller a “comunista,” and tries and partially succeeds in keeping Nora away from her. In Nora, Medina has created a strong, memorable female protagonist who wants to become a carpenter and plays a major role in holding her family together. Yet the responsibility is always more than she can handle, for she cannot be expected to “save” or protect the community singlehandedly from a dangerous sociopath who batters both her and her mother. She struggles with both fear and guilt that contribute to her being silent too long, and her dilemmas will resonate with readers who harbor difficult secrets. Vivid writing conveys with authenticity and interest the New York City of the 1970s, when economic distress, crime, drugs, and social unraveling threatened to destroy so many working-class neighborhoods. The Son of Sam killings and the July 13-14 blackout, fires, and looting were the best known examples, but the struggles played out in hundreds of thousands of homes, schools, workplaces, and streets. “¿Qué dijo el hombre?" Mima whispers. An excellent author’s note places the story events in the larger historical context, explains what is fact and fiction, and offers respect to the victims of these horrific crimes. Burn Baby Burn is highly recommended. A somewhat different version of this review appeared in The Pirate Tree (www.thepiratetree.com).